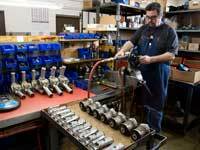 Top Cat Air Tools are manufactured in a state of the art facility in Willoughby, Ohio (a suburb of Cleveland). 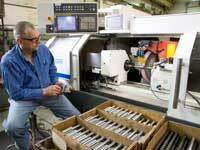 The facility houses our design, manufacturing, sales, and assembly processes. This co-location of all stages of production allows for an innovative and high quality product. The latest technology is employed to make Top Cat Air Tools the best tools on the market. Knowledgable salespeople are always available to answer your questions and help you find the perfect tool for your application. Top Cat Air Tools are assembled by master craftsman from many disciplines. These skilled people allow your tool to be modified easily to make your job easier.